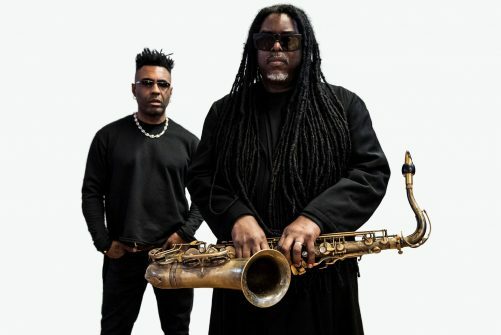 Courtney Pine presents Black Notes from the Deep’ featuring special guest vocalist Omar. since then he’s had numerous BBC Jazz Awards, MOBO’s, a Mercury Music Prize nomination and remained at the forefront of UK jazz, with a contemporary jazz style that integrates modern British sounds like drum n bass and UK garage alongside soul, hip-hop and deep rooted influences from across the Caribbean. With ‘Black Notes from the Deep’ (Freestyle Records) he returns to the tenor saxophone for the first time in a decade and features the vocal talents of UK soul star Omar, whose 1992 hit single ‘There’s Nothing Like This’ established a truly unique and instantly recognisable ‘signature’ sound that has since earned him widespread critical acclaim and seen him collaborate with the likes of Stevie Wonder, Erykah Badu, Carleen Anderson and Angie Stone. This very special project brings together two of the UK’s finest jazz and soul talents composing, recording and performing new original material together for the first time. This is a standing show.